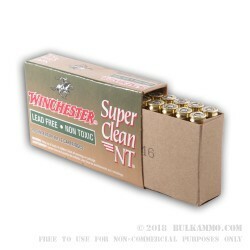 SuperClean NT (non-toxic) ammunition takes its name from the fact that it is made completely devoid of lead. 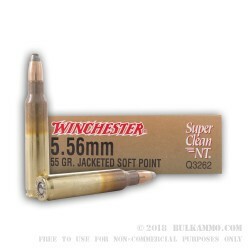 Accordingly, this round’s 55 grain copper jacketed soft point tin core bullet still delivers superior function and accuracy while creating a safer and cleaner shooting experience, an attribute of particular value in ecologically vulnerable environments. These rounds also offer non-corrosive brass casings with heavy metal free and waterproof lacquered Boxer primers, clean burning propellant for the reduction of powder residue accumulation, as well as 15% less felt recoil than comparable conventional duty rounds. The mouths of these rounds’ casings have additionally been applied with Black Lucas. With a muzzle velocity of 3,050 fps this round is suitable for personal protection, varmint hunting, and target shooting. It is further suitable for law enforcement, as it meets the standards for reliability and accuracy required by the FBI for their training and active duty ammunition. It is backed by the superior quality that Winchester has emphasized in all of their products since their establishment in 1873.